From the very beginning in 1934, these are the original adventures of the famous comic strip detective - collected in full for the very first time! Mandrake is a master of hypnosis, whose ability causes his opponents to encounter wild illusions, giving the heroes the upper hand in a fight. His enemies cover a broad spectrum, including gangsters, mad scientists, alien creatures, and characters from other adventures. His greatest ally is Lothar, "Prince of the Seven Nations" who gave up his crown to join Mandrake in his globe-trotting adventures. They are accompanied by the beautiful Narda, princess of a European nation and Mandrake's romantic interest. Mandrake's exploits are among the most stunning and exciting in the realm of comic strips. Created by Lee Falk, creator of The Phantom. Falk was fascinated with magicians from an early age, and sketched out the character himself. 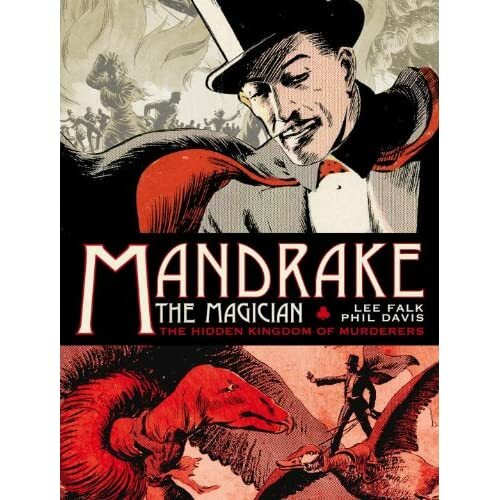 As a result, Mandrake looks a lot like Falk himself. He also had a passion for the theater, and wrote a play starring Mandrake, which his widow directed after he passed away. Artist Phil Davis helped Falk develop the strip, and once they sold it to King Features Syndicate, Davis was the artist from 1934 until 1964, when he passed away. Hermed er der chancen for at få Phantom og Mandrake komplet! For første gang nogensinde i samlebind!